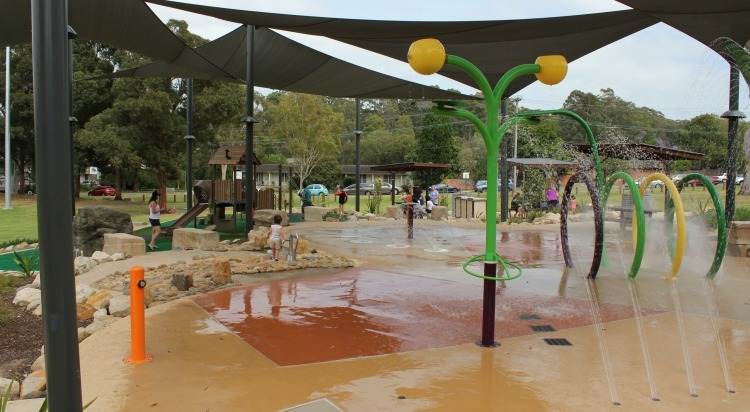 Set in the hillside at Dundas Park, Philip Ruddock Water Playground is a fabulous place to take the kids on a warm day. They will be able to pass plenty of time in the variety of water features including fountains and water jets, with the most popular being the tipping buckets. Alongside the Water Playground is also a small dry playground with a fort structure, slide and some swings. This is best suited to preschool aged kids although my 6 year old still enjoyed it for awhile. 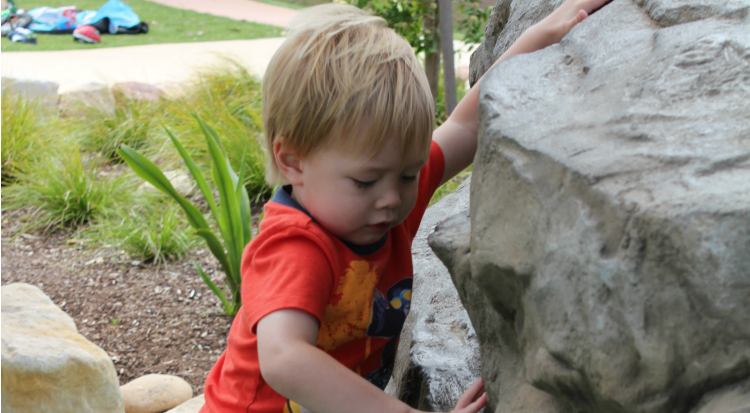 The highlight for him was climbing the big artificial rock there and jumping off. The sign there states no scooters and bikes but there is a path that circles the water playground that was quite popular for riding on the day I visited. The path is outside of where most people were sitting and playing so this didn’t present any problems on this particular day. There is also a path that circles the ovals there which my son rode around on his bike while my husband ran with him. Note that this is quite a distance and rather hilly, and that the kids will not be visible from the playground for large sections unless you go with them. Being a compact size and on a hillside it is easy to base yourself at one of the picnic tables or on a rug on the surrounding grass and watch your children without having to be right by their side (depending on their age of course!). Keep An Eye On Your Little Ones! There is just a low wooden fence between the water playground and the road and nothing in other parts. So, if a child was determined they could certainly get to the road. 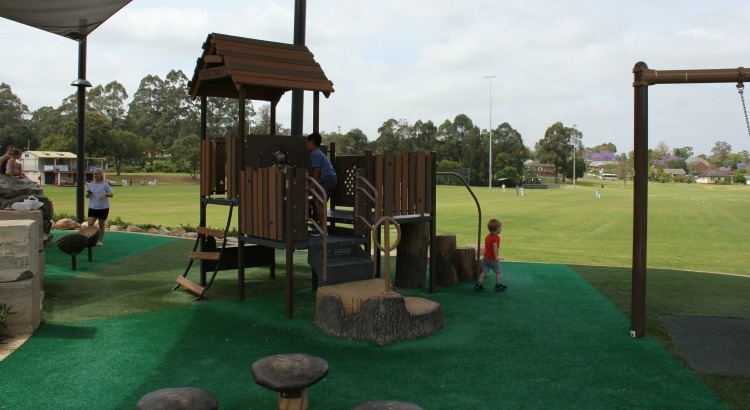 However, the playground slopes away from one road and is twenty metres from the other road. 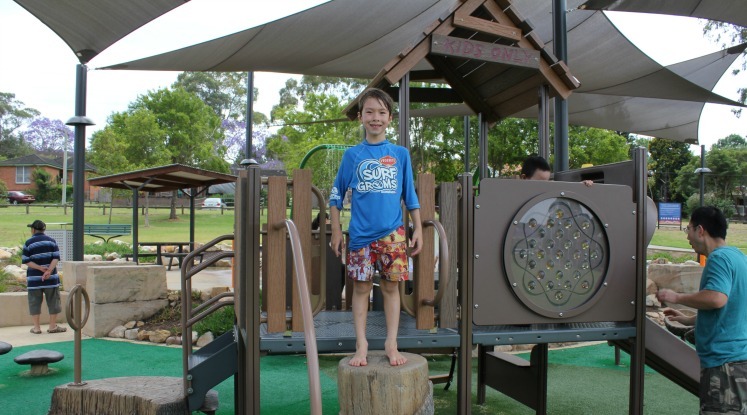 So with the design and so many water features to keep the kids busy, it is still relatively safe. There is a large stretch of grass next to the playground for ball games as well as the oval if it’s not being used for soccer and cricket, as it is on most weekends. These can be peak times for the water playground as families play here while their siblings or parents are participating in the matches. Bring your own picnic or use the BBQ facilities provided as there are not really a lot of food or coffee options nearby. Most of the local shops have recently been demolished and a new apartment block is currently being built at this location. Fingers crossed that a great cafe is going in underneath. If you want to leave the park, there is a bistro at the nearby Vikings Sports Club. 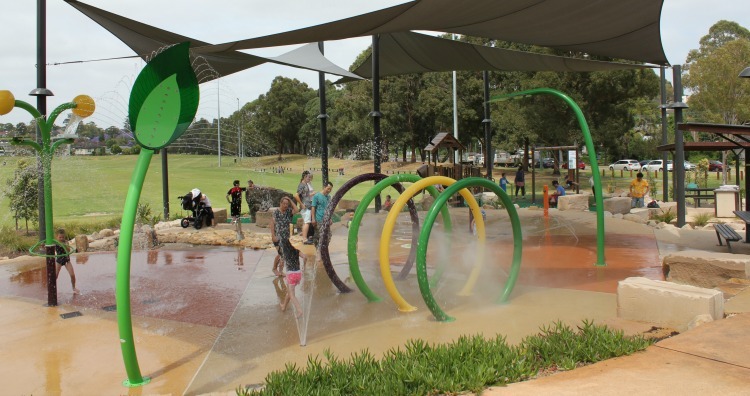 Overall, it is a pretty landscaped water playground with quite a few other activities if the kids get cold or tired of being wet. A great option on those hot days when you just don’t feel like getting wet yourself! Nearest Cafe: No cafe currently nearby. BBQ facilities available at the park. Vikings Sports Club is about 400m away and has a family-friendly bistro. 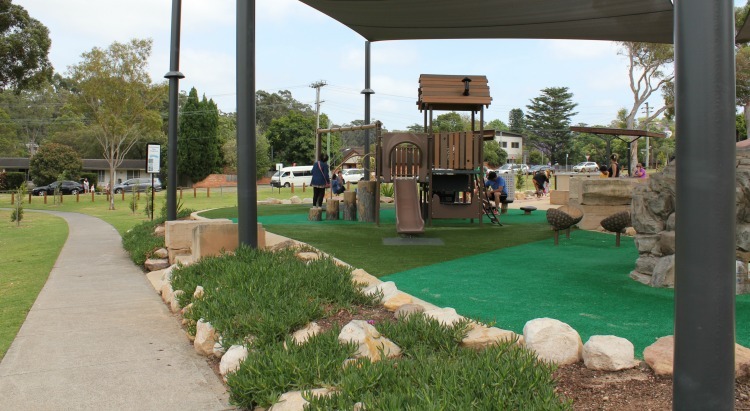 Toilets: The toilets are clean and about a fifty metre walk from the playground. Shade: More large shade cloths have been recently installed so there is plenty of cover over the water and dry playgrounds. 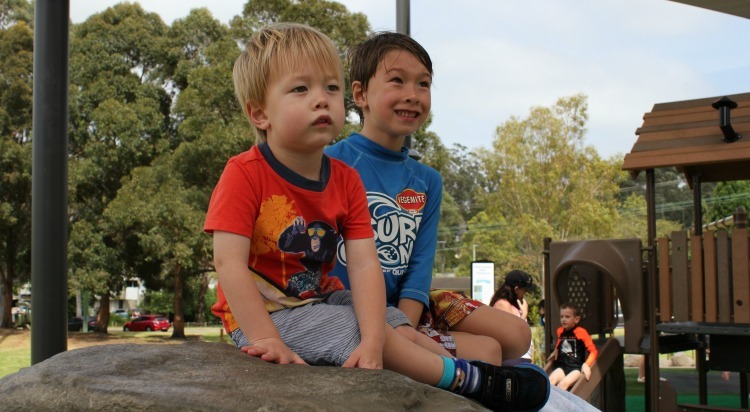 There are some trees around the water playground that could provide shade for picnicking. Parking: Plenty of free street parking. Can be more difficult on match days. Public Transport: There are buses to and from Eastwood Station. Best feature: It has a lovely landscaped setting.